Data depict flow of adolescents in study to assess electronic cigarette (e-cigarette) nicotine concentration vaped at baseline and subsequent use of combustible cigarettes and e-cigarettes. Baseline assessment occurred in the spring of 2015 among 10th grade students. Johnston LD, O’Malley PM, Miech RA, Bachman JG, Schulenberg JE. Monitoring the Future National Survey Results on Drug Use, 1975-2016: Overview, Key Findings on Adolescent Drug Use. Ann Arbor: Institute for Social Research, The University of Michigan; 2017. US Department of Health and Human Services, Public Health Service, Office of the Surgeon General. The Health Consequences of Smoking—50 Years of Progress: A Report of the Surgeon General, 2014. https://www.surgeongeneral.gov/library/reports/50-years-of-progress/index.html. 2014. Accessed March 24, 2017. Question Is the use of electronic cigarettes with higher nicotine concentrations prospectively associated with greater frequency and intensity of combustible cigarette smoking and vaping in adolescents? Findings In this cohort study of 181 adolescent electronic cigarette users, use of electronic cigarettes with higher nicotine concentrations at baseline was associated with greater levels of combustible cigarette and electronic cigarette use in the past 30 days at the 6-month follow-up and greater intensity of daily use after controlling for baseline use. Meaning Use of electronic cigarettes with higher nicotine concentrations may contribute to the progression to smoking and vaping at higher levels of frequency and intensity among youths. Importance Research indicates that electronic cigarette (e-cigarette) use (vaping) among adolescents is associated with the initiation and progression of combustible cigarette smoking. The reasons for this association are unknown. Objective To evaluate whether use of e-cigarettes with higher nicotine concentrations is associated with subsequent increases in the frequency and intensity of combustible cigarette smoking and vaping. Design, Setting, and Participants In this prospective cohort study involving students from 10 high schools in the Los Angeles, California, metropolitan area, surveys were administered during 10th grade in the spring (baseline) and 11th grade in the fall (6-month follow-up) of 2015 to students who reported using e-cigarettes within the past 30 days and the nicotine concentration level they used at baseline. Exposures Self-report of baseline e-cigarette nicotine concentration of none (0 mg/mL), low (1-5 mg/mL), medium (6-17 mg/mL), or high (≥18 mg/mL) typically used during the past 30 days. Main Outcomes and Measures Frequency of combustible cigarette smoking and e-cigarette use within the past 30 days (0 days [none], 1-2 days [infrequent], or ≥3 days [frequent]) and daily intensity of smoking and vaping (number of cigarettes smoked per day, number of vaping episodes per day, and number of puffs per vaping episode) at the 6-month follow-up. Results The analytic sample included 181 students (96 boys [53.0%] and 85 girls [47.0%]; mean [SD] age, 16.1 [0.4] years). Each successive increase in nicotine concentration (none to low, low to medium, and medium to high) vaped was associated with a 2.26 (95% CI, 1.28-3.98) increase in the odds of frequent (vs no) smoking and a 1.65 (95% CI, 1.09-2.51) increase in the odds of frequent (vs no) vaping at follow-up after adjustment for baseline frequency of smoking and vaping and other relevant covariates. Use of e-cigarettes with high (vs no) nicotine concentration was associated with a greater number of cigarettes smoked per day at follow-up (adjusted rate ratio [RR], 7.03; 95% CI, 6.11-7.95). An association with a significantly greater number of vaping episodes per day was found with use of low (adjusted RR, 3.32; 95% CI, 2.61-4.03), medium (adjusted RR, 3.32; 95% CI, 2.54-4.10), and high (adjusted RR, 2.44; 95% CI, 1.63-3.24) nicotine concentrations (vs no nicotine) at baseline. Similar results were found for the number of puffs per vaping episode for low (adjusted RR, 2.05; 95% CI, 1.41-2.70), medium (adjusted RR, 3.39; 95% CI, 2.66-4.11), and high (adjusted RR, 2.23; 95% CI, 1.42-3.03) nicotine concentrations. Conclusions and Relevance The results of this study provide preliminary evidence that use of e-cigarettes with higher nicotine concentrations by youths may increase subsequent frequency and intensity of smoking and vaping. In 2016, 11% of US 10th grade students reported using (vaping) electronic cigarettes (e-cigarettes) in the past 30 days.1 Prospective data demonstrate that youths who vape are more likely to initiate2-6 and progress7 to more frequent and heavy smoking. However, the reasons for these associations remain largely unknown. Identifying factors that underlie the progression of smoking and vaping among adolescents is critical for understanding, estimating, and preventing adverse health consequences of e-cigarette use among youths. Nicotine is the principal constituent of combustible cigarettes that maintains smoking dependence, particularly during early adolescence, a critical developmental period in which the brain is especially vulnerable to the addictive properties of nicotine.8 e-Cigarettes are available with a wide variety of nicotine concentrations, ranging from 0 mg/mL (ie, no nicotine) to more than 25 mg/mL,9 and use of e-cigarettes with higher nicotine concentrations has been shown to increase nicotine delivery to the bloodstream and may enhance the rewarding effects of vaping.10,11 Accordingly, adolescents who use e-cigarettes with higher levels of nicotine may be at greater risk for developing a tolerance to and dependence on nicotine that could contribute to the persistence and progression of vaping as well as use of combustible tobacco products. Recent cross-sectional studies suggest that considerable variation exists in the nicotine concentrations used by adolescents who vape12-14 and that use of e-cigarettes with (vs without) nicotine is associated with a greater likelihood of cigarette smoking and heavier e-cigarette use.14 However, whether gradations in nicotine concentrations are longitudinally associated with subsequent progression to higher levels of smoking and vaping remains unknown. Because e-cigarette solutions containing nicotine were recently deemed to be tobacco products and fall under the regulatory jurisdiction of the US Food and Drug Administration,15 assessing associations of e-cigarette nicotine concentration with use of tobacco products can inform regulatory policy addressing nicotine concentration in e-cigarette products. In the present study, we examined associations between the baseline e-cigarette nicotine concentration vaped and the subsequent frequency and intensity of combustible cigarette smoking and e-cigarette vaping at a 6-month follow-up among a sample of adolescent users of e-cigarettes. Participants included 10th grade students from 10 high schools in the Los Angeles, California, metropolitan area followed up as part of a longitudinal survey of substance use and mental health.2 Data were collected and processed at 5 semiannual assessments beginning in the fall of 2013, when the cohort was beginning 9th grade, through the fall of 2015. The e-cigarette nicotine concentration used by adolescent vapers was first assessed when the cohort was in 10th grade during the spring of 2015 (baseline for this report). We included data from all respondents who used e-cigarettes in the past 30 days, who reported the nicotine concentration that they vaped at baseline, and who completed past 30-day smoking and vaping frequency measures at the 6-month follow-up during the fall semester of 11th grade (N = 181). All data were collected using paper questionnaires at the participants’ high schools; participants who were not available on the day that the data were collected completed telephone or internet surveys. Individual participants were not monetarily compensated; however, each participating high school’s general fund was remunerated for staff time. The study was approved by the institutional review board of University of Southern California. Parents provided written informed consent, and youths assented to participation. e-Cigarette nicotine concentration levels typically vaped during the past 30 days at baseline were assessed with the question, “What level of nicotine (strength of e-liquid or juice) did you usually use in your e-cigarette?” The response options included none (0 mg/mL), low (1-5 mg/mL), medium (6-17 mg/mL), high (≥18 mg/mL), and “I don’t know.”16 Participants who did not know the nicotine concentration that they typically vaped were excluded (n = 28). Participants reported the number of combustible cigarettes that they smoked on each smoking day (0, 1, 2-5, 6-10, 11-15, 16-20, or ≥20) within the past 30 days. The survey included 2 questions to characterize vaping intensity. First, the number of vaping episodes per day was assessed with the question, “On the days you vaped, how many times did you usually pick up your e-cigarette device to vape?” (response options: 1, 2, 3-5, 6-9, 10-14, 15-20, or ≥20 times). Second, the number of puffs taken during each vaping episode was assessed with the question, “Each time you picked up your e-cigarette to vape, how many puffs did you usually take before putting it away?” (response options: 0, 1, 2, 3-5, 6-9, 10-14, 15-20, or ≥20 puffs).17,18 These response categories were recoded into quantitative count variables by taking the lowest value of each ordinal smoking (ie, 0, 1, 2, 6, 11, 16, or 20 cigarettes per d) and vaping (ie, 0, 1, 2, 3, 6, 10, 15, or 20 puffs or episodes) category for use in the intensity analyses. Preliminary analyses involved calculating descriptive statistics and distributional properties (ie, skewness and kurtosis) for all tobacco product outcomes and covariates, stratified by baseline nicotine concentration. We used χ2 and 1-way analysis of variance tests to assess differences in covariates by baseline nicotine concentration. Primary analyses used generalized linear mixed models with a random intercept to account for the clustering of students within their respective high schools. Polytomous (multinomial) regression models were used to test associations between baseline e-cigarette nicotine concentration (ie, none, low, medium, or high) and frequency of use in the past 30 days (ie, 0, 1-2, or ≥3 days) at follow-up. Nicotine concentration was treated as a continuous variable (ie, grouped linear term [0 indicates none; 1, low; 2, medium; and 3, high]). Combustible cigarette and e-cigarette use outcomes were evaluated in separate models with no use of each product in the past 30 days at follow-up as the reference groups. Models were first tested as unadjusted without covariates and were then adjusted for baseline smoking frequency and vaping frequency in the past 30 days and all aforementioned interpersonal, intrapersonal, and demographic covariates. One participant was excluded from the adjusted model of associations with smoking frequency owing to missing baseline smoking frequency covariate data (N = 180). Because the daily intensity outcome variables (ie, cigarettes per day, vaping episodes per day, and puffs per vaping episodes) were not normally distributed (ie, overdispersed), negative binomial regression models were used to assess associations with baseline nicotine concentration.23 Baseline nicotine concentration was treated first as a continuous and then as a categorical variable, with no nicotine serving as the reference category. The negative binomial regression coefficients were exponentiated to obtain rate ratios (RRs). After testing unadjusted models, adjusted models controlling for all demographic, interpersonal, and intrapersonal covariates as well as frequency of use of the alternate product in the past 30 days (eg, for the smoking outcome, past 30-day use of e-cigarettes was adjusted for) and the respective baseline intensity measure matching the outcome (ie, cigarettes per day, puffs per vaping episode, or vaping episodes per day) were tested. Only observations with complete data on respective vaping and smoking variables were used, resulting in samples ranging from 168 to 181 participants. To address missing covariate data in the adjusted models, 5 multiply imputed data sets were generated using the Markov-chain Monte Carlo method with available covariate data.24 The variable estimates (odds ratio [OR] or RR) from the polytomous and negative binomial regression models in each imputed data set were pooled and presented as a single estimate. We used SPSS software (version 24; IBM Corp) and SAS software (version 9.4; SAS Institute) for analyses; significance was set to .05, and all tests were 2-tailed. Among the 4100 students eligible to enroll in the parent study at the outset of ninth grade, assent and parental consent were obtained from 3396, 3252 of whom completed the spring 10th grade assessment (baseline for this report). At baseline, 235 students (7.2%) reported vaping in the past 30 days; 54 total participants were excluded from the analytic sample: 18 did not answer the nicotine concentration question, 28 responded, “I don’t know,” and 8 were excluded for an absence of data at follow-up (Figure). Students who vaped in the past 30 days and were excluded from the analytic sample did not significantly differ from those included on any covariates or smoking and vaping variables. The analytic sample of 181 students was relatively evenly distributed between boys (96 [53.0%]) and girls (85 [47.0%]) (mean [SD] age, 16.1 [0.4] years). Among participants with data available, most were Hispanic (88 [49.7%]) and did not have parents who graduated college (87 [56.5%]). Sixty-three participants (35.0%) had used cigarettes within the past 30 days (ie, dual users) at baseline (Table 1). At baseline, 108 participants (59.7%) reported vaping a solution with nicotine during the past 30 days. Of these, 52 participants (28.7%) vaped a low nicotine concentration; 35 (19.3%), a medium nicotine concentration; and 21 (11.6%), a high nicotine concentration (Table 1). The prevalence of smoking and vaping frequency at follow-up by baseline nicotine concentration level is reported in independent models (Table 2). For each 1-level increase in baseline nicotine concentration (ie, none to low, low to medium, and medium to high), the odds of participants reporting frequent smoking in the past 30 days (vs no smoking) at follow-up were 2.43 times greater (95% CI, 1.58-3.76). This association remained significant after adjustment for covariates (OR, 2.26; 95% CI, 1.28-3.98). Use of higher e-cigarette nicotine concentrations at baseline was not associated with increased odds of infrequent (vs no) smoking in the past 30 days in the unadjusted (OR, 1.21; 95% CI, 0.72-1.98) or adjusted (OR, 1.01; 95% CI, 0.54-1.89) models (Table 2). For each 1-level increase in baseline nicotine concentration, the odds of frequent vaping in the past 30 days (ie, ≥3 days) compared with no e-cigarette use at follow-up were 1.73 times greater (95% CI, 1.24-2.41). This association remained significant after adjustment for covariates (OR, 1.65; 95% CI, 1.09-2.51). In unadjusted (OR, 1.06; 95% CI, 0.69-1.59) and adjusted (OR, 0.98; 95% CI, 0.59-1.60) models, e-cigarette nicotine concentration used at baseline was not associated with infrequent vaping (Table 2). We found no significant differences in daily smoking quantity between youths who did not vape nicotine and youths who vaped low or medium nicotine concentrations at baseline in adjusted models (Table 2). Compared with youths who did not vape nicotine at baseline, those who vaped high nicotine concentrations smoked 14.17 times as many cigarettes per day (95% CI, 13.00-15.33), and this association remained significant after adjustment for covariates (RR, 7.03; 95% CI, 6.11-7.95). Relative to adolescents who did not vape nicotine at baseline, youths who vaped low-nicotine concentrations vaped approximately 2.4 times as many puffs per vaping episode (RR, 2.41; 95% CI, 1.65-3.18); those who vaped medium nicotine concentrations, approximately 4.9 times as many puffs per vaping episode (RR, 4.90; 95% CI, 4.16-5.65); and those who vaped high nicotine concentrations, approximately 3.7 as many puffs per vaping episode (RR, 3.67; 95% CI, 2.77-4.57). These findings demonstrated a positive linear trend (RR, 1.57; 95% CI, 1.18-2.08). Similarly, relative to adolescents who did not vape nicotine at baseline, youths who vaped low nicotine concentrations had approximately 2.5 times as many vaping episodes per day (RR, 2.46; 95% CI, 1.62-3.30); those who vaped medium nicotine concentrations, approximately 2.8 times as many vaping episodes per day (RR, 2.77; 95% CI, 1.89-3.66); and those who vaped high nicotine concentrations, 3.9 times as many vaping episodes per day (RR, 3.90; 95% CI, 2.94-4.86). These findings also demonstrated a positive linear trend (RR, 1.76; 95% CI, 1.33-2.33). All associations between baseline nicotine concentration vaped and vaping intensity outcomes remained significant after adjustment for covariates (Table 2). Youths who vaped e-cigarettes with higher nicotine concentrations at baseline were more likely to progress to higher frequency and intensity levels of vaping and smoking at 6-month follow-up after adjusting for baseline e-cigarette and combustible cigarette use. Although previous studies have examined cross-sectional associations of e-cigarette nicotine concentrations used by youth and patterns of smoking and vaping,12-14 to our knowledge this is the first prospective study to evaluate the association of varying e-cigarette nicotine concentrations with future smoking and vaping behavior. 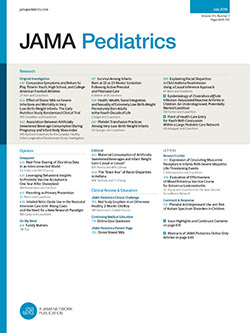 In the context of research demonstrating that youth who use e-cigarettes are more likely to initiate2-6 and progress7 to higher levels of combustible cigarette use, the present findings suggest that the overrepresentation of frequent and high-intensity smoking among youths who vape may be accounted for by nicotine concentration in e-cigarettes. Intensity of combustible cigarette smoking at younger ages is associated with increased nicotine dependence later in life.25,26 Exposure to higher levels of nicotine during early adolescence increases the risk for nicotine dependence27 and adversely affects attentional processes,28-30 executive functioning,31 and inhibitory control.32 Youths in this study who vaped higher nicotine concentrations at baseline may have developed a tolerance to and dependence on nicotine and thus increased their levels of vaping and smoking to accommodate nicotine-induced adaptations resulting from e-cigarette–related nicotine exposure. Because of the potential neurocognitive effects of nicotine exposure in the adolescent brain,33,34 teenagers who vape higher nicotine concentrations may also be prone to poor decision making and risk-taking behaviors, including increased vaping and smoking. Although biologically plausible, whether nicotine-induced tolerance, dependence, neural dysregulation, or other cognitive (eg, expectancies) and social (eg, peer affiliations) factors explain the observed associations warrants further investigation. Shared unmeasured risk factors may also explain the association between use of e-cigarettes with higher nicotine concentrations and trajectories of accelerated vaping and smoking. Although we cannot exclude this possibility, we attempted to address this issue analytically by adjusting for demographic, interpersonal, and intrapersonal risk factors for vaping and smoking, including baseline vaping and smoking levels. Adjusted ORs and RRs did not meaningfully differ from the unadjusted estimates, suggesting that the available covariates are unlikely to confound the associations demonstrated herein. Among 10th grade students in the 2015 US Monitoring the Future Study,13 27% of the 704 participants who had vaped in the past 30 days and 41% of the 268 participants who vaped 6 or more times in the past 30 days reported that e-cigarettes used in their most recent vaping episode contained nicotine. In this study, the prevalence of nicotine vaping among all participants who vaped within the past 30 days (including in the denominator those who did not know whether the e-cigarette they typically used contained nicotine) was 108 of 209 (51.7%). One reason why nicotine vaping may have been more common in the present sample is that participants in this study vaped within the past 30 days and were asked what nicotine concentration they typically vaped during that period, whereas the 2015 US Monitoring the Future Study assessed the substance vaped in the most recent episode.13 Because youths may alternate use of different liquids that may or may not contain nicotine, youths who vape nicotine may not necessarily have used an e-cigarette containing nicotine during their most recent vaping occasion, which would result in lower nicotine vaping prevalence estimates than would result when assessing the substance typically vaped. Alternatively, the participants in this study were all from California, and California adolescent e-cigarette users may vape nicotine at higher rates than national samples. Strengths of the study include the demographically diverse sample, high rate of retention, and detailed assessment of smoking and vaping intensity. Limitations include the relatively small sample, reliance on self-report data, and lack of biochemical verification of reported e-cigarette nicotine concentrations vaped by youths. Evidence suggests that nicotine concentrations in vaping liquid can be mislabeled, however, because chemically verified nicotine concentrations have typically been found to be higher than mislabeled concentrations, our estimates may be conservative.35 The observational period in this study captures an important, but brief, window in adolescent development, and extension to longer periods of follow-up is warranted. The study did not assess or account for nicotine dependence or other e-cigarette device variables (eg, device generation, wattage, and machinery efficiency) that may affect nicotine absorption into the bloodstream.36,37 Further research with larger samples is needed to elucidate whether nicotine concentration per se exerts a causal effect on smoking and vaping and subsequent nicotine dependence among youth. Among the adolescent e-cigarette users in this study, use of e-cigarettes with higher nicotine concentrations at baseline was associated with progression of smoking and vaping frequency and intensity at 6-month follow-up. Given the US Food and Drug Administration’s 2016 Deeming Rule, the results of this study provide preliminary evidence that regulatory policies addressing nicotine concentration levels in e-cigarette products used by adolescents may affect progression of combustible cigarette and e-cigarette use among youths. Corresponding Author: Adam M. Leventhal, PhD, Department of Preventive Medicine, University of Southern California Keck School of Medicine, 2001 N Soto St, 3rd Floor, Ste 302-C, Los Angeles, CA 90032 (adam.leventhal@usc.edu). Accepted for Publication: July 13, 2017. Author Contributions: Dr Goldenson and Mr Stone had full access to all the data in the study and take responsibility for the integrity of the data and the accuracy of the data analysis. Study concept and design: Goldenson, Leventhal, McConnell, Barrington-Trimis. Drafting of the manuscript: Goldenson, Leventhal, Barrington-Trimis. Statistical analysis: Goldenson, Stone, Barrington-Trimis. Administrative, technical, or material support: Goldenson, Stone. Study supervision: Leventhal, McConnell, Barrington-Trimis.